The story of Audunn and the bear -- A dry spell -- The old hay -- When I was on the frigate -- Father and son -- The fox skin -- New Iceland. 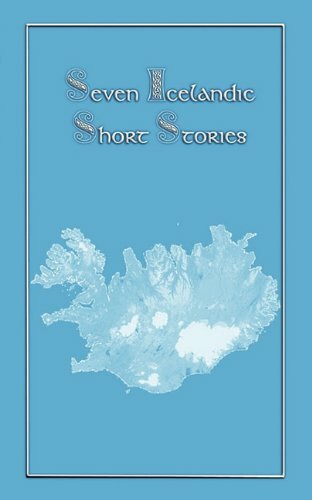 Of the seven Icelandic short stories which appear here, the first was probably written early in the thirteenth century, while the rest all date from the early twentieth century. The Norsemen who colonized Iceland in the last quarter of the ninth century brought with them the language then spoken throughout all of Scandinavia. This ancestor of the modern Scandinavian tongues has been preserved in Iceland with the oldest preserved Icelandic prose written almost 1000 years ago. Limited communications between Iceland and other countries, frequent migrations inside the island, and, not least important, a long and uninterrupted literary tradition has meant the Icelandic language has not developed any dialects in the ordinary sense. Since the 12th C. the Icelandic people have continued to tell stories and to compose poems with the greyness of commonplace existence made more bearable when listening to tales of the heroic deeds and sagas of the past. In the evening, the living-room (baðstofa), built of turf and stone, became a little more cheerful, and hunger was forgotten, while a member of the household read, or sang, about far-away knights and heroes, and the banquets they gave in splendid halls. In their imagination people thus tended to make their environment seem larger, and better, than life, as did Hrolfur with his fishing-boat in the story "When I was on the Frigate". So take some time out and travel back to a period before television and radio, a time when tales were passed on orally when families would gather around a crackling and spitting hearth and a family member would delight and captivate the gathering with stories passed on to them from their parents and grandparents and from time immemorial. 33% of the net profit from the sale of this book will be donated to charity.